Lots of space art goodness for today. OK this one is for Michael S. We had been talking about this poster and I promised to blog about it when it got here. 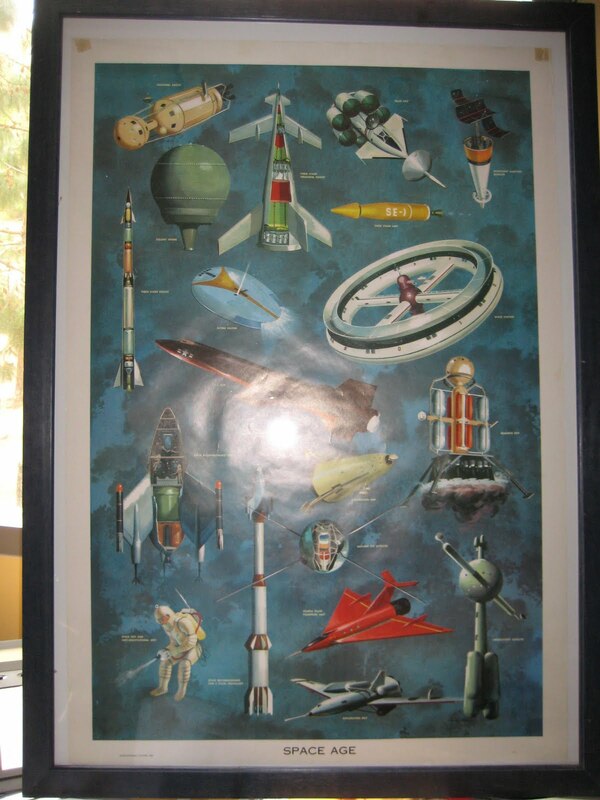 Only identifying information on it is: Copyright 1959 Educational Posters #117 "Space Age"
This poster is one of those that gets stuck in your memory. I don't know when I first saw a copy but when I found images of it online a few years ago I kept trying to find one. 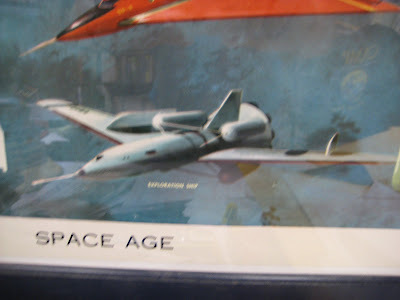 Part of the problem is that all the identifying information is so generic: "Space age," "Educational Posters," etc. 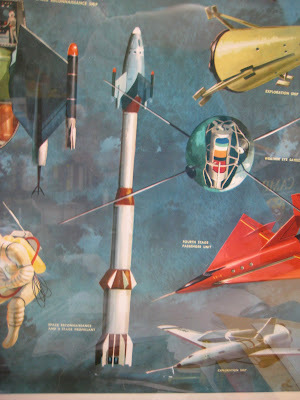 What is special about it is that it is paintings of rockets, satellites, a flying saucer, and an astronaut. These are from a wide variety of sources including the Collier's series, the Disney series, and a few other interesting inspirations. Each image is labeled so I will give the label in case it is too small to see. 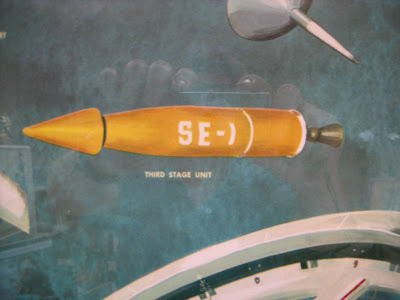 "Space reconnaissance and 3 stage propellant"
The artist was Richard Amundsen. Educational Posters evidently produced a number of posters for classrooms including HISTORY OF SHIPS, HISTORY OF FLIGHT, SPACE AGE and CHILDREN OF OTHER LANDS. Educational Posters Co., was a division of Dow (Louis F) Co. Sorry for the low quality photographs but I wanted to show as much detail as I could. You are -- as already well and repeatedly established -- The Man! Thanks a googleplex for what can only be the greatest blog post in the history of the known universe, imho. And a special thank you for going to the trouble to photograph and comment on the individual poster elements. * How right you are about the genericness of the key terms here, "space age" and "educational posters" -- no wonder I never found anything. And even today, armed with that information (now including the "#117"), I'm still not spotting anything else on the Web. Where did you find those online images a few years ago? Still have a (working) link? 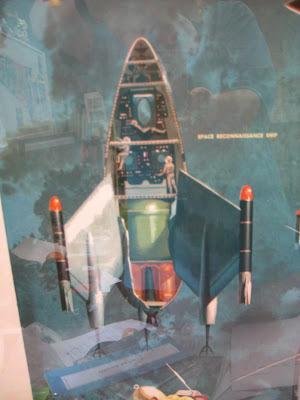 * I presume all the spaceships were repainted for the poster rather than reproduced from their various original sources. 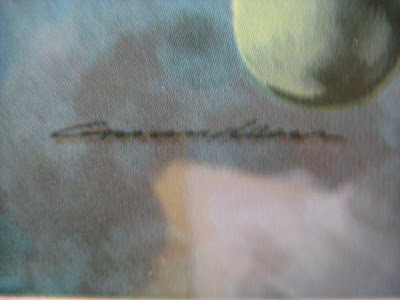 Do you note an artist's signature? * I wonder where that memorable "Colony Sphere" came from, assuming it's not an original design! 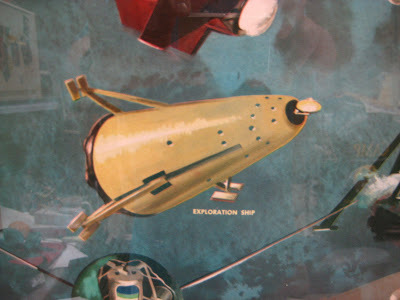 * I'm pretty sure the "Exploration Ship", or something much like it, is also from the von Braun/Bonestell/Collier's/Disney nexus. 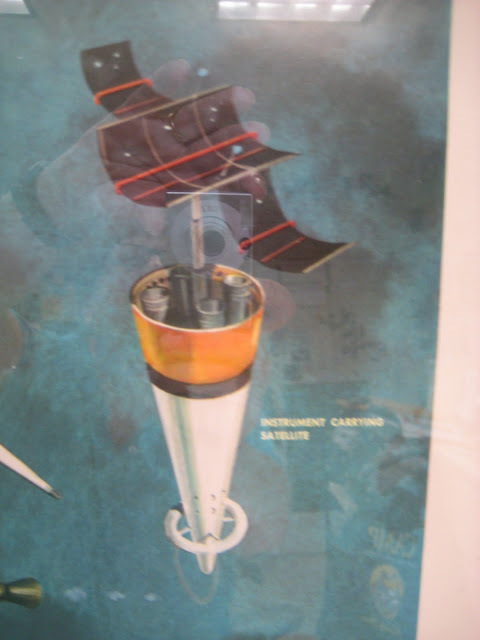 * "Observatory Satellite" -- another original design, or just something resembling a lot of other era space stations? Hmm. Anyhow, thanks again for making my day/week/month! I keep refining this post, based on my research and your comments. Keep checking and contributing ideas. 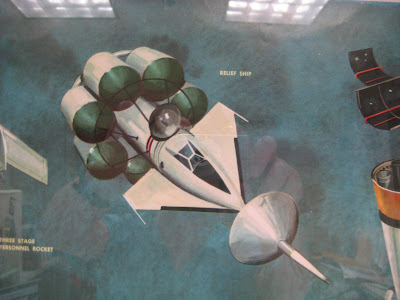 The "Space Reconnaissance Ship" is a Frank tinsley design for an orbital scout ship, as is the solid-motor 3-stage booster for it, from "Modern Mechanix" magazine; that "Exploration Ship" is a Tinsley design, too, from the same magazine. 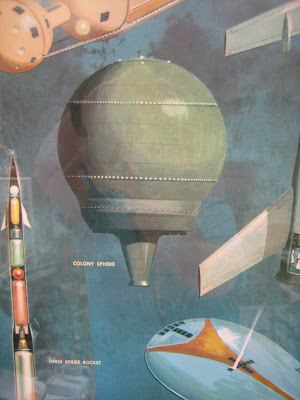 I think the "Colony Sphere is tinsley, too, from a design for a generation ship in a series of adverts from the Bosch Armament Company. 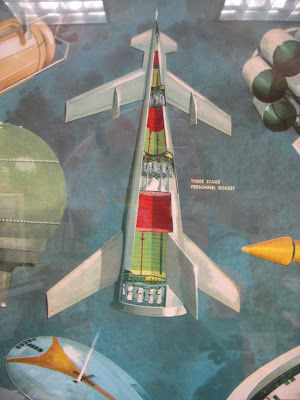 You can see more on the exploration ship on the "Atomic Rockets of the Space Patrol" website. 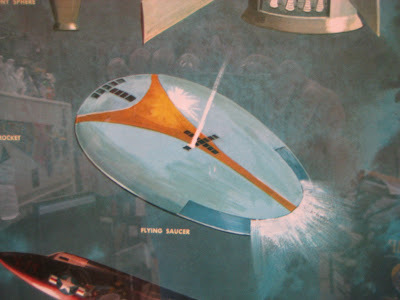 The flying saucer is from "The Flying Saucers are Real" paperback from Gold Medal. Grif: Thanks for that information! 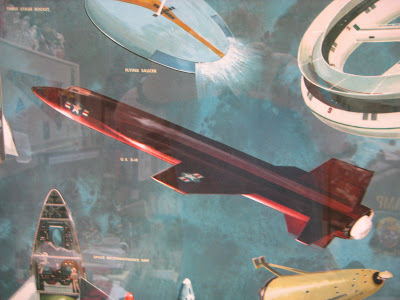 And to think I even visited the "Deck Plans" page at Atomic Rockets not long ago and gazed upon the "G. Harry Stine's Space Scout".... 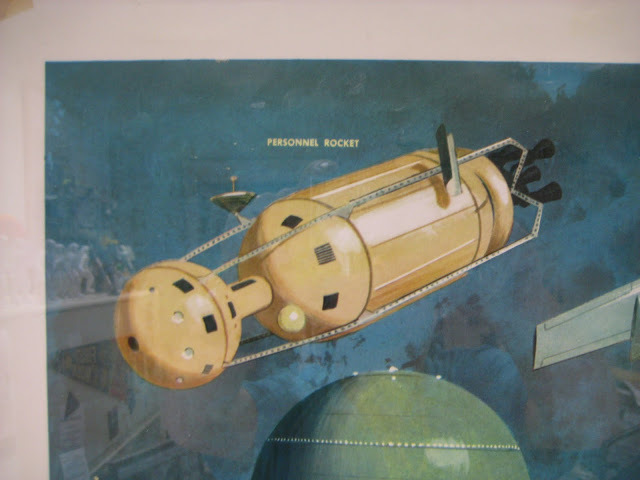 It's interesting to note that it comes from Tinsley's book "The Answer to the Space Flight Challenge", the reference in Megan Prelinger's new "Another Science Fiction" I'd most like to find. (Heads up to anyone in NYC: Prelinger speaks at a local B&N tomorrow night.) 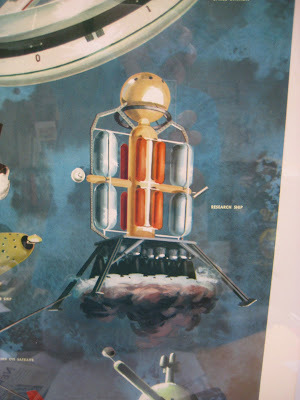 I only wish I could find more on the Colony Sphere, though; just did a bit of searching and came up with nothing. Graham: Ah ha, the legendary Keyhoe "classic". 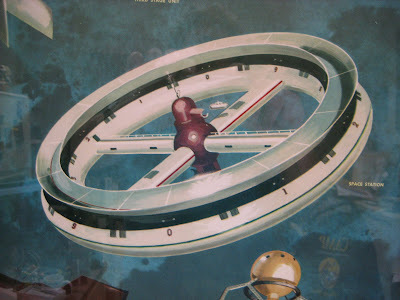 I knew I'd seen that saucer around, other than on my childhood copy of the poster in question. And would you believe it -- it's another Tinsley! 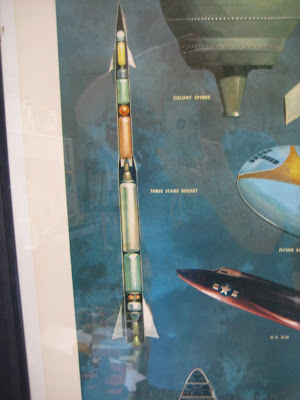 John: I do believe you're right about the "Observatory Satellite" being the Convair Manned Observation Satellite, even if the center sections differ (perhaps the artist preferred a simple sphere to all that complex, curvy tubing?). And yes, I even built the Glencoe version of the model ages ago, sigh. As for the signature, (1) it doesn't seem to be Tinsley's, so we can at least rule that out, and (2) it would interesting to compare it to the signatures, if any, on the other Educational Posters -- assuming you bought those as well. Perhaps someone else here recognizes it? One more thing I forgot to inquire about the first time. 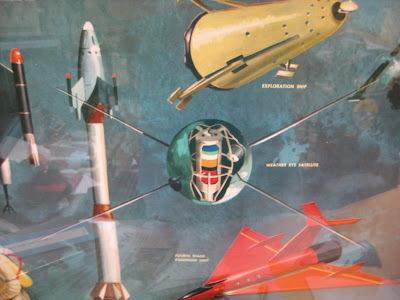 Usually, your convention for naming your images involves combining the title of the work and its year of publication/creation; e.g., "1966exploringspace.jpg". But this time they all start with "WashingtonDC2009". No doubt there's a good story behind this deviation from the beaten track...? Don't tell me you were in Washington last year and saw the same poster through the same NASA officer's window! Simply the labels given by the digital camera I was using. I was in DC last summer. This is the greatest poster of all time. Now of course I desperately want one. Thanks for giving me something else to obsess over! Sorry I'm coming late to the party. Yes, this is the greatest blog post of all time. You see, I had that poster when I was a little boy. I've wanted to see it again after all these years. 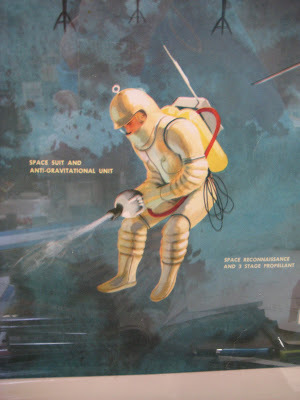 When I was putting the Tinsley illustration of Stine's space scout on my web site, I had this nagging feeling that I had seen in before. Now I know why. I too would love to find a copy of it. I've been working on identifying the various spacecraft in the poster. 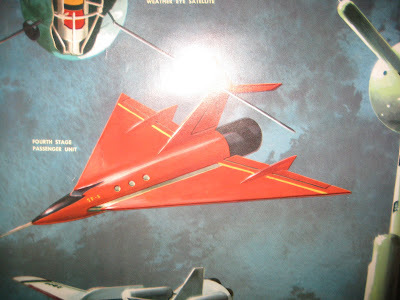 Its a shame they never built these. I have this poster framed and up on the wall. I bought it when I was a kid probably in 1959, at the Freedomland amusement park in the Bronx, NY. Torn down and replaced by Co-Op City housing development. My poster says, "Satellite City, Freedomland, U.S.A." at the top. From info given, the actual company was Educational Posters Co., a division of Dow (Louis F) Co. They later licensed the image to others. 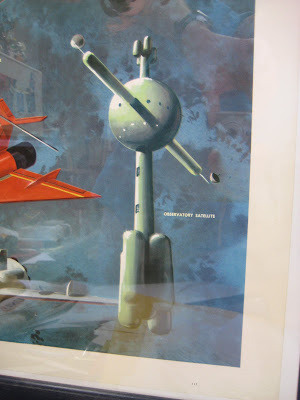 The Space Age artist is Richard Amundsen, who had a New York agent.